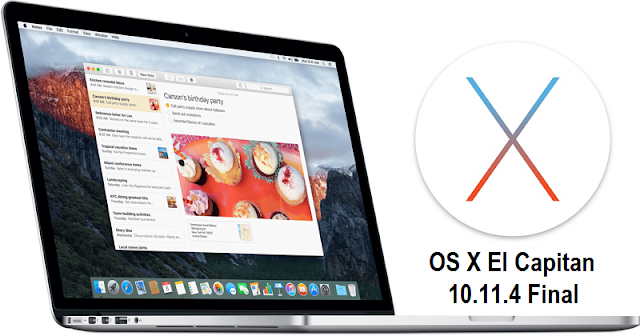 Apple has officially released its fourth major update for OS X 10.11 El Capitan Mac operating system. The latest final version of OS X El Capitan 10.11.4 (Build: 15E65), Xcode 7.3 (Build: 7D175), OS X Server 5.1 (Build: 15S5127) and Safari 9.1 updates are publicly available for installation on various Mac devices for Free. The official Direct Download Links of OS X 10.11.4 Final Combo, Delta and Setup .DMG Installer Files are available below. Apple has brought several new functions and features in all new OS X 10.11.4 Update i.e. Live Photos in Messages, Secure Notes, Improved Web Browser, Performance Enhancement, Security Improvement, Bugs Fixes and many more. 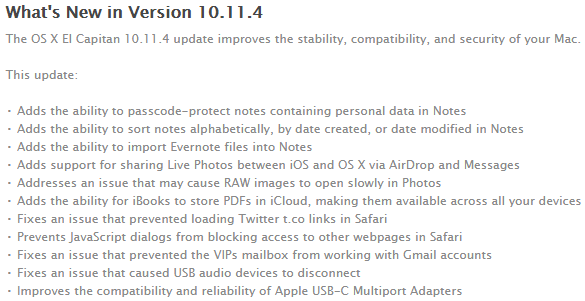 You can read Full OS X 10.11.4 Changelog in image below. 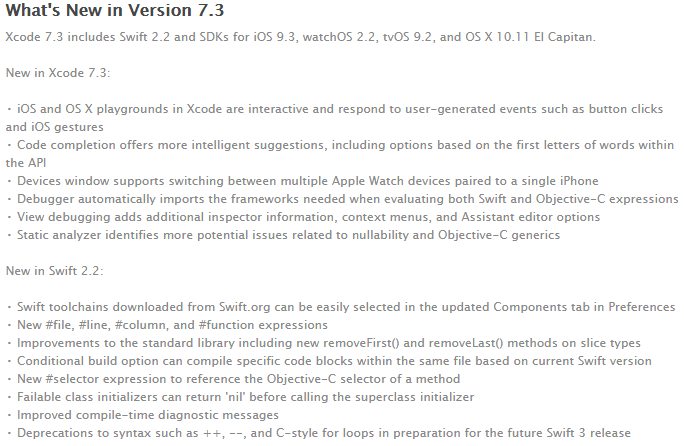 The newest Xcode 7.3 Update includes; Swift 2.2, iOS 9.3 SDK, watchOS 2.2 SDK, tvOS 9.2 SDK and OS X 10.11.4 SDK. How to Install OS X 10.11.4 Update Manually? All users running an old OS X 10.11.3 version can navigate to App Store >> Software Update option for latest updates directly from Apple. If you want to perform manual OS X 10.11.4 installation on multiple Mac computers/laptops through Bootable USB or Bootable DVD using iTunes, then Download OS X 10.11.4 Without App Store via Direct Links.